Optimum Opti-Seal is a revolutionary paint protection formula that creates unmatcthed slickness and gloss with just a few drops per vehicle. 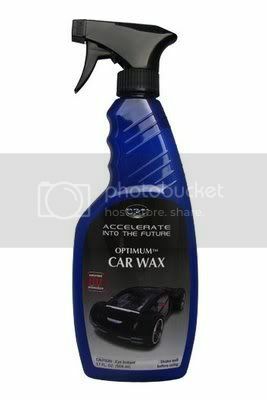 30ml of product is enough product to completely seal and protect 4-5 cars! Opti-Seal leaves no residue and requires no buffing. Just wipe on and walk away. It is a true paint sealant with no cleaning properties and therefore must be applied to a perfectly clean surface for optimum performance. It seals and protects paint under a crystal clear barrier of cross-linked polymers. Dirt, moisture, oil, and UV radiation are all sealed out of the painted surface to maintain optimum gloss and all this takes only minutes to apply. The science behind Optimum Opti-Seal is incredible. The super concentrated polymer sealant begins cross-linking as soon as it hits the paint. Opti-Seal flashes almost immediately to leave a polymer film on the paint. 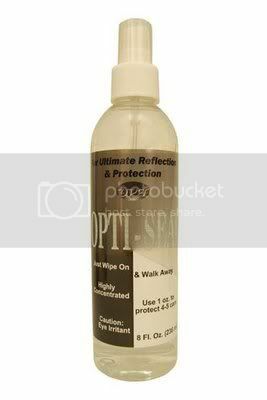 Opti-Seal provides durable protection for paint, plastic trim, and wheels. Optimum Car Wax (OCW) is the only "spray on" wax that provides the durability of a paste wax and long-lasting UV protection. It contains a combination of high-grade Carnauba wax, sealant polymers and UV inhibitors to form a protective layer on the surface and protect the paint from sun damage and environmental elements for up to 5 months. 1. Easy to use and takes less than 15 minutes to wax a complete vehicle. 2. There are no buffing of wax residues to deal with. It is a simple spray on, wipe off formula. 6. Won't stain plastic trim - In fact, you can spray Optimum Car Wax on these surfaces too to protect them! Optimum Protectant Plus (OPP) cleans, restores and protects leather, vinyl and plastic molding surfaces. Protectant Plus contains a balance of cleaners, penetrating oils, reactive polymers and UV inhibitors to restore original colour to these surfaces, protect against and hide any scratches, and prevent sun damage. Just like automotive paint systems which have undergone major changes in technology, automotive leather and vinyl surfaces have also had some considerable improvements in the past decade. Nearly all automotive leather surfaces are treated with special chemicals to provide resistance to scratching and marring and increase durability and protection from weathering. The chemistry of vinyl surfaces has improved dramatically also, to give these surfaces a leather look and feel. The vinyl surfaces are also treated with similar chemicals as those used for automotive leather to increase their durability and protection from weathering. Over a period of months, these protective chemicals are lost from the surface. Optimum Protectant Plus cleans and replenishes these chemicals while adding UV protection. Most over-the-counter leather and vinyl protectants leave an oily film behind which gives them a glossy look and slick feel. Since these products are not absorbed into the surface, they last only a few days and act as a dust magnet. 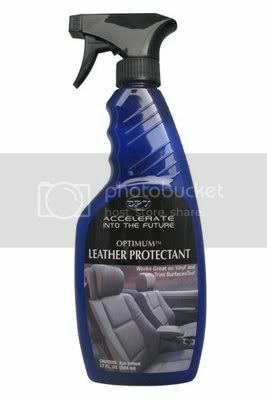 Optimum Protectant Plus will keep leather supple with a natural satin finish. It helps reduce cracking on leather and vinyl surfaces, as well as reducing scratching and marring. Protectant Plus penetrates and adheres to these surfaces, therefore it does not make them oily or slick and provides lasting protection. Optimum Opti-Coat 2.0 is the most advanced polymer system that adds a permanent layer of clear coat over the automotive finishes. Optimum Opti-Coat 2.0 provides better scratch and mar resistance, better UV resistance, better chemical etch resistance, and has better release properties than factory clears. Optimum Opti-Coat 2.0 therefore keeps your car clean longer and continues to bead water and sheds dirt for years.